Learn about a variety of evidence-based interventions that support skills development for school-age children. Read great information on how to raise community awareness and ensure your voice is heard. The father of two boys with autism shares the need for flexibility and open-mindedness to propel the autism community forward. An excellent explanation on procedural safeguards (parental rights) when seeking the appropriate special education services for your child. The mother of four boys skillfully uses an analogy to describe her family’s autism journey. A mother provides an important narrative on talking to a child with autism about staying safe and protecting his/herself. A young man with Asperger’s syndrome shares how video games have made a difference in his life. A certified speech-language pathologist explains important steps to take upon receiving an AAC device to help a child become a good communicator. Find out about a business that gives people with autism opportunities to work and transition well into adulthood. Dr. Moore shares an insightful conversation with a young woman she first evaluated for autism as a child. Atypical View from an Autism Mom: AutismTV is Not a Hashtag! The mom of a young child with autism analyzes the advantages and disadvantages of autism-centered television shows and characters. A mom shares how she found a better way to celebrate and create happy memories for her son with autism. Two occupational therapists provide a recent study that shows how occupational therapy can assist the entire family. An early intervention specialist for children and director of college governance at Bergin University of Canine Studies explains the importance of educating families and protecting service dogs. A loving mother describes her young son with autism and what makes their relationship special. Easy ways to help your child develop good eating habits using an innovative tool known as video self-modeling. Deanna Klingel’s unique story of a young girl with autism during World War II England addresses autism characteristics as well as the many misconceptions. An author and motivational speaker interviews Gina Badalaty, a freelance blogger who has been writing about raising children with special needs and living a non-toxic life since 2002. Christine Bronstein and Karen L. Young combine their talents with this charming book that celebrates flexibility and individuality. Learn about an iPad game called Sayin’ It Sam that uses speech recognition technology so children can play using their voices. In her book, Diane Dokko Kim identifies and treats the fear, guilt, and inadequacy that parents of children with special needs can encounter while providing readers with spiritual support. Learn the dynamic ways Julie Hornok has changed the landscape for families affected by autism by bringing them together for support. Stephanie Murphy offers encouragement for families touched by autism drawing on extensive experience with autism and wisdom from her Christian faith. Learn about the important modifications recently made to ABLE account rules following tax legislation that passed earlier this year. For more than 50 years, the Autism Society has been improving the lives of people affected by autism through education, research, and advocacy. Nearly 25 years ago, this grassroots organization launched a nationwide effort to promote acceptance and appreciation resulting in April being named National Autism Awareness Month in the United States. And for more than a decade, people around the world have recognized April 2 as World Autism Awareness Day, encouraging Member States of the United Nations to raise awareness throughout the world and aid in research, diagnoses, and treatment on a global level. It’s encouraging to see the attention both these observances create on an international level, from special autism events and workshops to vital fundraisers and sponsorships. With millions of people around the world affected by autism, this level of consciousness is key to the future. It also reminds me there are so many ways to connect and be heard. This month, we plan to celebrate the power of the autism voice, because everyone matters. If you want to find ways to unite with the autism community and make a difference, please take a look at Katherine G. Hobbs’ piece this month, How You Can Promote Autism Awareness This April, as she provides information on ways to raise community awareness. Every time I see someone wearing a T-shirt or lapel pin celebrating love for someone with autism, I feel like it’s a step toward awareness and perhaps toward a better understanding. And with understanding, I can hope for acceptance. Another word that has been running through my brain this month is “inclusiveness.” I hope that is the next step. Inclusiveness is more than being allowed to participate. It’s more than being invited to the class party. It’s more than being accommodated in an activity. Inclusiveness is being made to feel a part of something, to really belong. We are excited about this month’s magazine as it has a little something for everyone, from professional advice on ways to protect a child’s educational rights to tips on developing important skills. We also feature inspirational autism advocates, newly published book summaries, and interesting new products on the market. And perhaps most importantly—the voice of the autism community. First off, we are thrilled to share Nicole Bovell’s piece Parent Rights and IEP Placement Options You Need to Know as she explains procedural safeguards (parental rights) when seeking the appropriate special education services for your child. Her expert advice includes information on laws and regulations surrounding inclusion and placement to help guide families in the right direction. 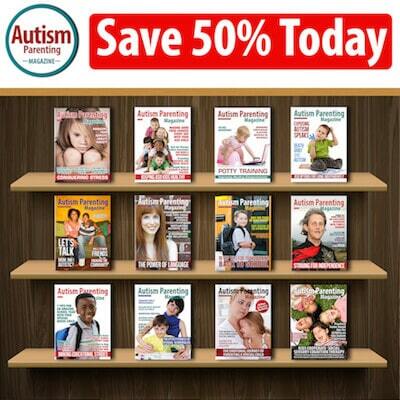 Developing skills is an important topic in every issue of Autism Parenting Magazine. 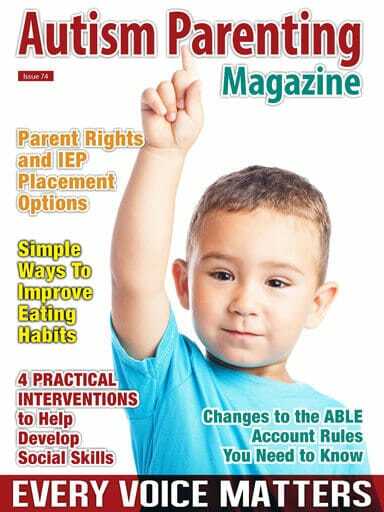 This month we have several articles that focus on improving social skills and communication skills, as well as simple tips for helping a child with autism develop good eating habits. Take a look at Monica C. Hudnall’s, MA, CCC-SLP, piece, 4 Practical Interventions to Help Develop Social Skills, as she provides a variety of evidence-based interventions that support skills development for school-age children. Techniques such as comic strip conversations, social narratives, technology-aided instruction, and intervention and video modeling are sure to help a child struggling with social skills. If your child has an augmentative and alternative communication (AAC) device, or you are considering purchasing one, take a look at Rebecca Eisenberg’s, MS, CCC-SLP, article Expert Tips for Getting the Most Out Of an AAC Device as the certified speech-language pathologist explains ways the device can make a difference in daily life. Her tips include home and school training as well as ways to connect with others while building success with new routines. Last month we featured a piece on teaching social skills through video-self modeling written by Melissa M. Root, PhD, president and founder of Root Success SolutionsTM LLC. This month, Melissa provides ways this tool can help your child with autism develop good eating habits. Take a look at Simple Ways To Improve Eating Habits When Your Child Has ASD as Melissa shares ways to create short videos of your child to show his/her brain exactly what to do in specific situations. And best of all, these videos can be tailored to meet your child’s circumstances. Perhaps it’s my in my blood, but I get very excited when we have an opportunity to feature different perspectives in Autism Parenting Magazine. As the daughter of a former editorial writer for a large daily newspaper, I understand the power of opinion. Voices encourage discussion and inspire change. We have several personal narratives this month that might reinforce your beliefs, or maybe alter your point of view. Either way, these pieces get us all thinking and talking. For example, several new shows on television feature people on the autism spectrum. While many people believe putting characters with autism in the spotlight translates to autism awareness and acceptance, Sharlene T. Smith, PhD, has some concerns about how some characters are portrayed. Please read Atypical View from an Autism Mom: AutismTV is Not a Hashtag! as the mother of a young child with autism expresses her apprehension about autism-centered television shows and characters. It seems like the benefits of service dogs for people diagnosed with autism is always in the news—the connection between man and dog is incredible. Rebecca Richardson, an early intervention specialist for children and director of college governance at Bergin University of Canine Studies with autism, agrees but has some concerns about the lack of education surrounding service dogs. Please take a look at her piece Ethical Considerations Need to Be Made for Service Dogs, as Rebecca explains the importance of educating families and protecting these special working canines. Let’s continue to share, connect, and celebrate the power of the autism voice.